New Students for a Democratic Society: SDS 10th Annual National Convention - REGISTER NOW! SDS 10th Annual National Convention - REGISTER NOW! NOT A MEMBER OF SDS, BUT WANT A TABLE? REGISTER A TABLE HERE! 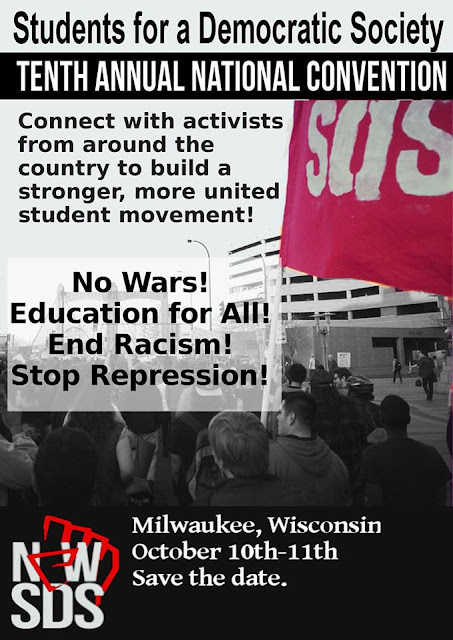 Since our reorganization in 2006, SDS has grown to be the largest anti-war and education rights student and youth organization active in the US today. In the past nine years SDSers around the country have won major victories on their campuses and in their communities fighting tuition hikes and for the right of all people to a good education. We have built large coalitions with other student and youth organizations not only to fight back against attacks on education but also to land serious blows against racism, patriarchy, and war. Students from around the country will converge to discuss the future of the student and youth movement in the US. Workshops at the convention will cover topics including anti-war, education rights, LGBTQ liberation, anti-racism, immigrant rights, national liberation, and more. Whether you're in SDS or not, we want you at the convention. Meals will be provided, housing will be provided and travel stipends may be available depending on need and cost.